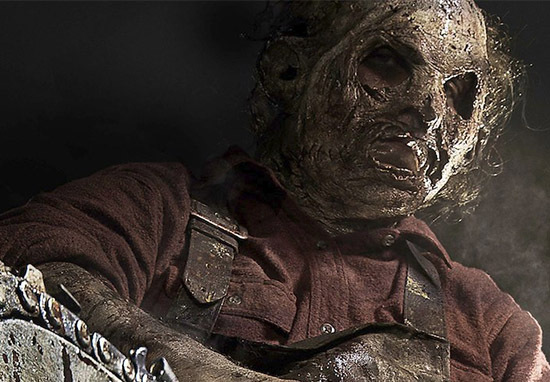 Leatherface is making a return in the Texas Chainsaw Massacre prequel and it looks absolutely horrifying. Leatherface goes down in history as one of the most nightmare-inducing characters in the horror film world and is pretty much tops every NOPE list as someone you’d never want to come face-to-face with. However, it’s time to face the terror once more as Leatherface, the prequel has 100 per cent been confirmed and will definitely be descending upon cinemas in the autumn, according to Digital Spy. Just to make sure people have got plenty of time to mentally prepare before the film’s release, the producer Christa Campbell shared a chilling photo on Twitter confirming the news Leatherface will be returning in October. This time round, the story is going to be exploring how the chainsaw wielding maniac came to be the monster he was and has apparently been in the pipeline for a longtime after the huge success of Texas Chainsaw 3D. How anyone could tolerate it in 3D – as if he’s actually there in front of you – is beyond me, but there we go. The foreboding-sounding film is directed by french directors, Alexandre Bustillo and Julien Maury and Stephen Dorff and Lili Taylor are playing the leads as Texas Ranger Hal Hartman and Leatherface’s mumVerna Sawyer. Ex-EastEnder actor Sam Strike will play Jackson – the disturbed teen who later becomes the cold, mask-wearing, killing machine, Leatherface. Of course – just to add to the terror – this time round the plot is set around a mental institution, as Leatherface pursues for aggressive teens who have kidnapped a nurse and are trying to escape. The Texas Chainsaw Massacre remake was released four years ago – yes it’s stayed with me that long – and almost quadrupled it’s $15 million budget, raking in nearly $50 million from keen horror-fans.